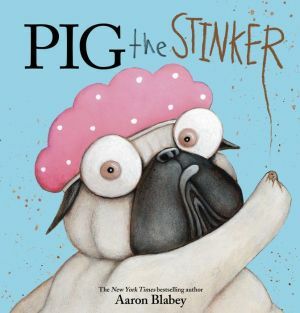 In this hilarious adventure, Pig the Pug STINKS! Pig likes to be smelly, so he rolls around in the garbage, laps up spoiled milk, tracks dirty paw prints all over the house, and even sticks his head in the toilet! But enough is enough! Pig's owner tries to get him to take a bath, but Pig refuses! Pig has a plan to stop up the tub, but when it backfires, will Pig get clean after all? Rich with author-illustrator Aaron Blabey's signature rhyming text and unforgettable illustrations, Pig the Stinker is a laugh-out-loud story that teaches Pig -- and readers -- an important (and hilarious) lesson, just like in the five previous books in the series (Pig the Pug, Pig the Winner, Pig the Elf, Pig the Star, and Pig the Fibber).